Nikola Jokic picked up his fourth triple double of the season, and Torrey Craig had a double double to help the Nuggets defeat the Heat. The Denver Nuggets defeated the Miami Heat, 103-99, on Tuesday night, picking up a win on the second night of a road back-to-back. Nikola Jokic had a 29 point, 11 rebound, 10 assist triple double, while Torrey Craig stepped up in a huge way with an 11 point, 16 rebound double double. Dion Waiters had 15 points in his first game this season for the Heat to lead them in scoring. Malik Beasley got the start for the Nuggets with Gary Harris out with another injury. His fellow 2016 draft class guard, Jamal Murray, got the first basket for the Nuggets, cutting to the basket and getting the ball from Nikola Jokic. The big guy’s first basket came courtesy of Hassan Whiteside goaltending a shot in the paint, but the Nuggets started just 1 for 5 from the floor. The game continued to be defined by missed baskets, as both teams struggled to put the ball successfully through the hoop. By the time the subs started rotating in, it was just 12-8 Nuggets. The Nuggets got in the bonus shortly after the bench started trickling in, and they used the free throw line to help pad their lead. The Nuggets defense held strong through the quarter, limiting the Heat to only 18 points on 6 for 23 shooting from the field. We got Brandon Goodwin minutes to start the second quarter, while Dion Waiters took the court for the first time in over a calendar year for Miami. Waiters spurred a small run, drawing the Heat within three points by being aggressive attacking the rim. Kelly Olynyk, a dirty player, tied the game with a 3-pointer from the left corner. Jokic was too slow getting back in transition, and Justise Winslow was able to bully through Beasley in transition for an easy layup with no big man to help protect the rim. The Heat’s run was ended by a Craig corner 3-pointer, but Waiters responded with a triple of his own. By the end of the quarter, the defense that helped Denver have a first quarter lead had completely vanished. The Winslow-Olynyk pick and roll was causing all sorts of chaos for the Nuggets, who kept switching or going over against players that really don’t need that kind of defensive coverage. The Heat bench outscored the Nuggets bench 30-13, and were the main reason why Miami had a 52-49 lead going into halftime. What hurt the Nuggets defense is that Plumlee picked up three fouls in the first half. He’s their best shot blocker, and without him, the Heat were able to drive to the rim knowing that Jokic wasn’t going to be an issue for them once they got there. Miami started the third quarter with three consecutive baskets (after a Whiteside miss), and the 7-0 run triggered a rage timeout from Coach Malone. The two teams traded baskets, relying on Jokic to help create shot attempts with his passing. Jokic tossed in a shot from the paint, drawing the Nuggets within two, and the reserves started to make their way into the game. Juancho Hernangomez subbed into the game, after reports in the first half that he would miss the game due to fatigue. Craig gave the Nuggets the lead again with another triple from the left corner, his third made 3-pointer of the game. Lyles beat the buzzer with a floater in the lane to tie the game up at 76, which mercifully ended an ugly quarter for both teams. Hernangomez played some bad basketball at the start of the fourth quarter, getting beat by Dwyane Wade and committing a really bad turnover. The Nuggets took a five-point lead courtesy of back-to-back triples from Trey Lyles and Malik Beasley. After a Heat timeout, Lyles knocked in another triple, putting the Nuggets up by six. The Heat answered back with two triples, and just like that, the game was tied again. Miami’s run continued after a timeout by Denver, with Jokic ending with after 10 straight points with a flip shot in the lane. With the clock hitting five minutes remaining, the Nuggets were within five points. After a Heat timeout, the Heat found Bam Adebayo AGAIN for another alley-oop dunk, and Malik Beasley got stripped by Dion Waiters on the next possession. Jokic worked until the final seconds of the shot clock, fading away in the paint for a jumper. The Nuggets scored eight straight points, going to Millsap against Wade, and Craig tipping in another offensive rebound. Adebayo had yet another alley-oop dunk, but the Nuggets forced a miss on their next defensive possession. The refs made a stupid call on Jokic, calling him for travelling while he was dribbling in the post, and then Adebayo hooked in a shot in the paint to tie the game with 22.9 seconds left on the clock. Murray got the ball after the timeout for the final possession, and found Jokic in the paint off a pick and roll, with the big guy flipping in a heavily contested jumper with 2.9 seconds left to give Denver a two point lead. The Heat would fork up the inbounds pass, Murray knocked down his free throws, and the Nuggets would win the game by a score of 103-99. Torrey Craig, first team all-hustle. There’s a reason why Craig continues to get the nod in the starting lineup, and why he’s one of the leaders in minutes played recently. He’s a guy that Coach Malone loves — he dives for loose balls, he picks up his defender in the backcourt, he gets offensive rebounds, and he tries every possession. He deserves a shout-out for setting a new career high in rebounds tonight with ____ and picking up a double-double. Juancho not himself. Juancho didn’t play a single second in the first half, and in the second half, he repeatedly got cooked by Dwyane Wade. I can understand getting fooled by a wily vet, but getting blown past a player that’s in his farewell season? That’s not a good look. The Nuggets need his offense, but if he’s just going to go out there and crap his pants, he deserves whatever doghouse treatment he gets. Nikola Jokic continues to shine. It’s not just that he got another triple double. It’s not just that the offense collapsed when he was off the court. It’s not just that he hit the game-winning shot with 2.4 seconds left. It’s that he’s able to do stuff like this all the time. Tonight was a tough matchup for Jokic, going against Whiteside, Adebayo, and Olynyk. Adebayo had a few big dunks, but the Heat only had one player in double digits for rebounds, and the Nuggets won the rebounding battle 50-38. The team had 32 assists on 41 made field goals. That’s Jokic-ball in it’s purest form. Let’s continue to see games like that throughout the rest of the season. Would beating the San Antonio Spurs in the first round be validation for the 2018-19 Denver Nuggets? 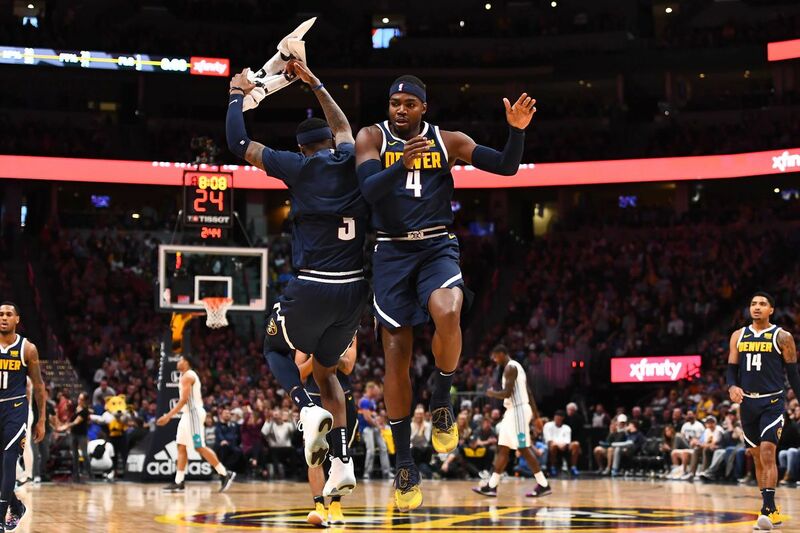 Nuggets Numbers - Breaking down the first round series against the Spurs and looking ahead to Game 6 The Nuggets have caught the Spurs in a math problem.